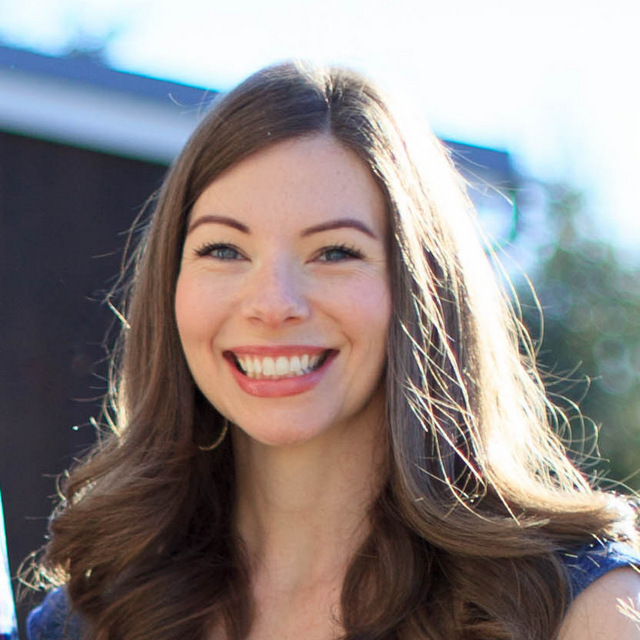 Oh, I am so excited about this project. I love leopard print, it’s no secret. 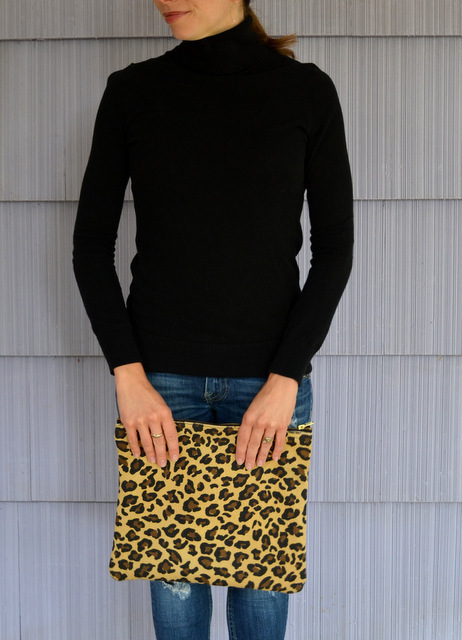 I’d guess 50 percent of my Pinterest finds contain leopard of some sort. 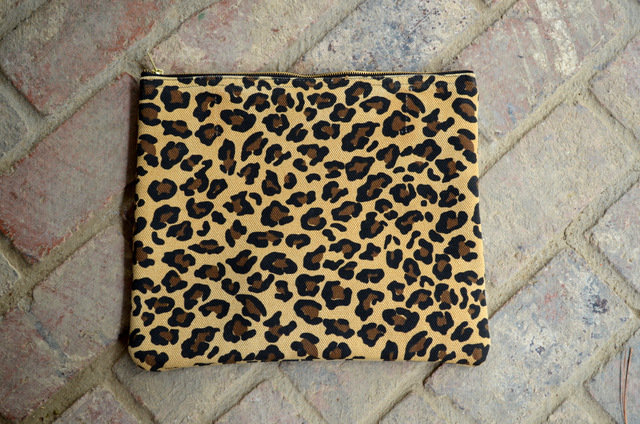 I’ve been wanting to make a leopard clutch for months – maybe even years – but until this fall, I hadn’t been able to find the right materials. 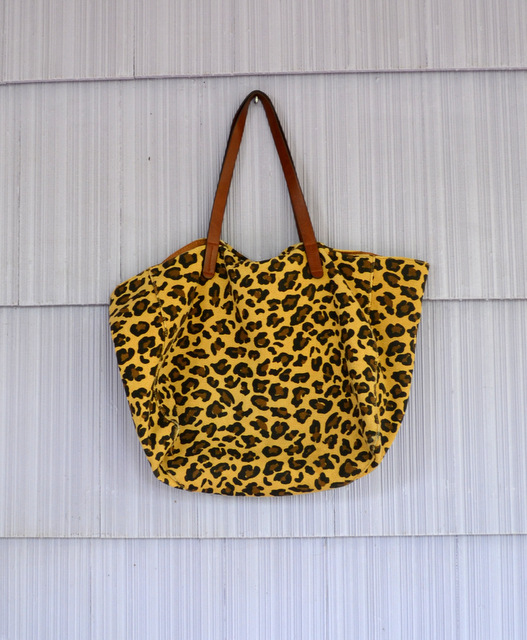 But then, I popped into the thrift store a few weeks ago and found this Gap leopard canvas print tote bag. For $4. Perfect! The weight of the material is just right – a clutch needs something thick to keep its structure. The bottom edges are a bit worn, but I can cut around them for the clutch. I started with scissors, cutting around the largest pieces of material. The tote had some seams, but I wanted the clutch to just simple and streamlined, so I just wanted to use the front and back panels of the tote. 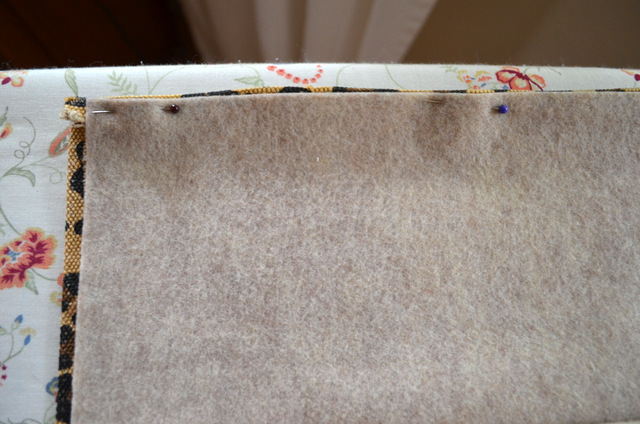 Then I used my seam ripper to carefully remove the other pieces and leave only two panels of material, front and back. I learned a lot about tote construction as I was tearing apart this bag. WOW! 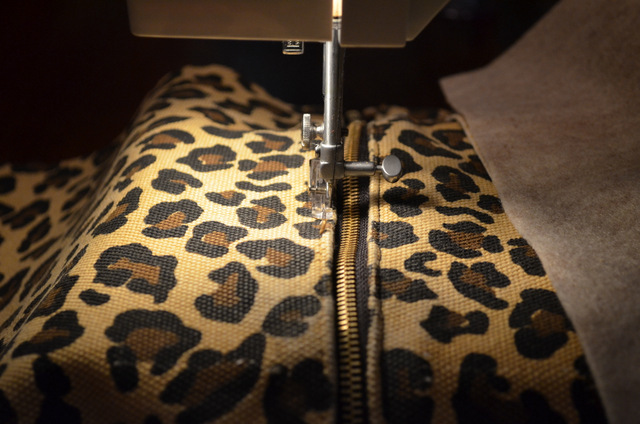 Glue and interfacing and seams and incredibly thick thread – this was a well-made tote. I found some felt (not really coordinating, but it’s what I had in the largest pieces) to create a lining. Not wanting to make the same mistake of sewing the pieces together incorrectly, I searched for my old Leather Clutch project and read through the directions several times before proceeding. 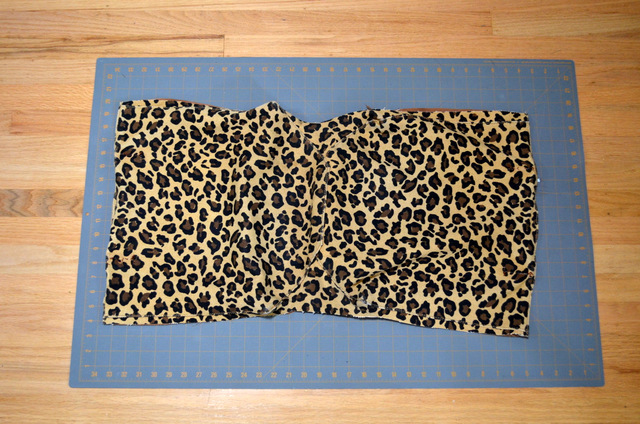 Then I realized that the fabric from the tote was already creased, so I ended up assembling the clutch in a different way – this time I put the zipper under the fabric and sewed along the previous tote’s hemline. Then I did the same as the other clutch – partially unzipped the zipper, placed right sides facing, and stitched up the remaining three sides. 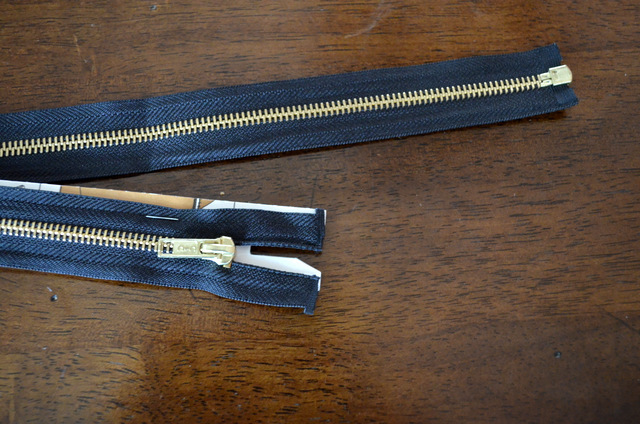 I trimmed the corners and turned the bag right side out through the open zipper. YES! This is exactly what I’ve been wanting! …but that can also be folded over to be a bit smaller. I am so happy with how it turned out! This might be my most favorite project EVER. Are you a clutch person? I love them. I feel like my shoulder bag is my Mom Purse, a small step up from a diaper bag, still filled with wipes and snack, a book, and an extra bag for hauling groceries. I have to leave my Mom Purse at home when I’m heading out for a date with Husband or to meet up with friends. 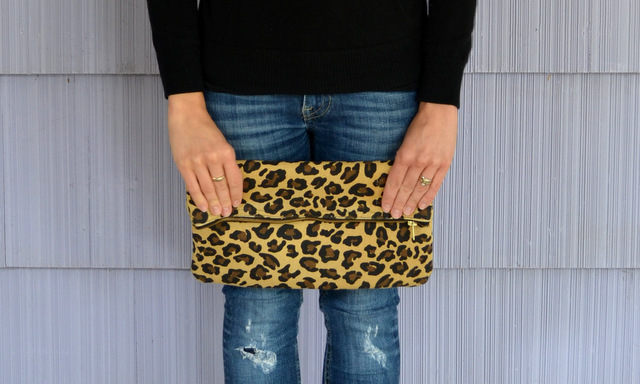 Maybe that’s why I tend to collect clutches – because they symbolize a fun night out. Are you like that? 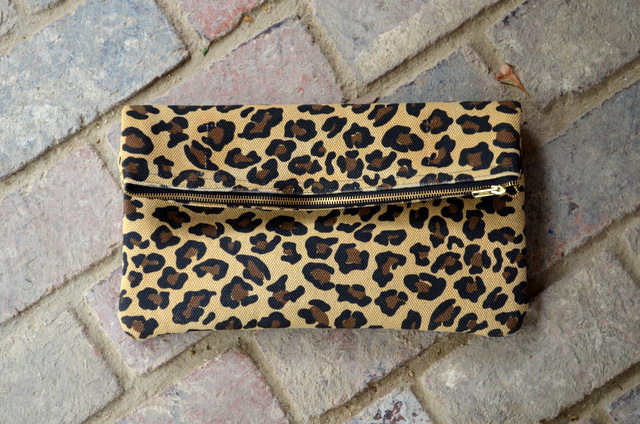 If it’s not clutches, is there something you collect that symbolizes something for you? Just curious. Ha! It’s true. She tells me when it’s time for a “peditale”. Wow – love how you repurposed that! Naw, I’m not a clutch person. I use a Baggelini, which goes across my chest and hangs in back. It was expensive, but I’m going on six years with it and there’s no real wear on it. So it was worth the cost to me. I prefer my purses to be out of the way, so either the Baggelini or else a fanny pack. I don’t care how out of style they are either! :) I think fanny packs come in and out of style because they are pretty practical.